Mexican food was introduced to me by my hubby when I came to US. Soon I fell in love with this cuisine as it was little spicy like Indian food. We used to eat out a lot on those days when we were least concerned about our health and there was no rules or regulations. But things changed when kids were born, we started paying more attention to what we eat and what we give to the kids, eventually restaurant visits slowed down. I was so fond of salsa and used to make it home even then to enjoy with some chips. Kids also got the hang of it. Slowly I started experimenting with other Mexican food. Remember my last post with the recipe for Homemade Tortillas? Here is what I made with that batch of Tortillas. 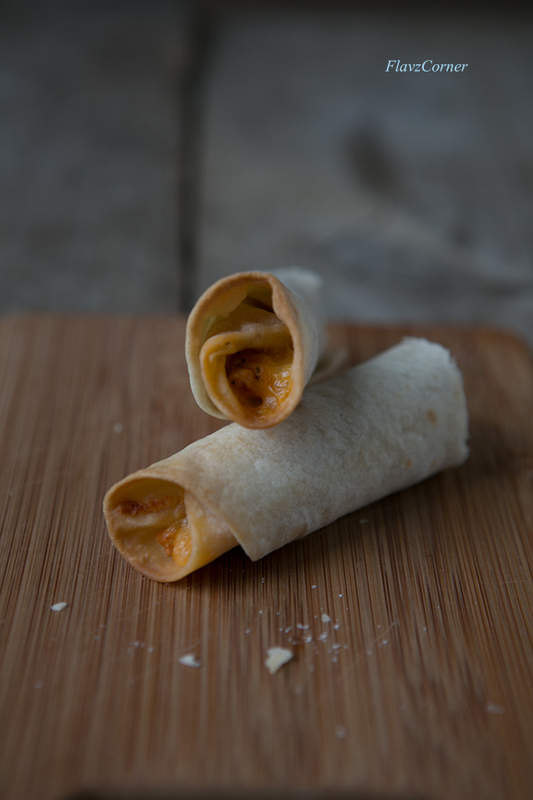 Hope you will try this Taquitos and they are delicious by the way. We used to buy the frozen Taquitos, but now that I make it and kids like it, I don't have to buy it anymore. You can roll them and freeze it and bake it later when needed. It is an easy appetizer and you can even use them for lunch by adding more filling it in. Simply preheat the oven and plop them in there to enjoy a quick appetizer/lunch. Drain excess water from the chicken pieces. Heat a non stick pan with 1 tsp. of oil. Add the minced garlic to it and cook till it get golden yellow. Now add the chicken pieces, pepper powder, salt and chili powder and cook on medium heat till water evaporates and the chicken is well cooked. Add hot/mild salsa and chopped Cilantro to the chicken and cook on low heat for 30 seconds and turn off the burner. 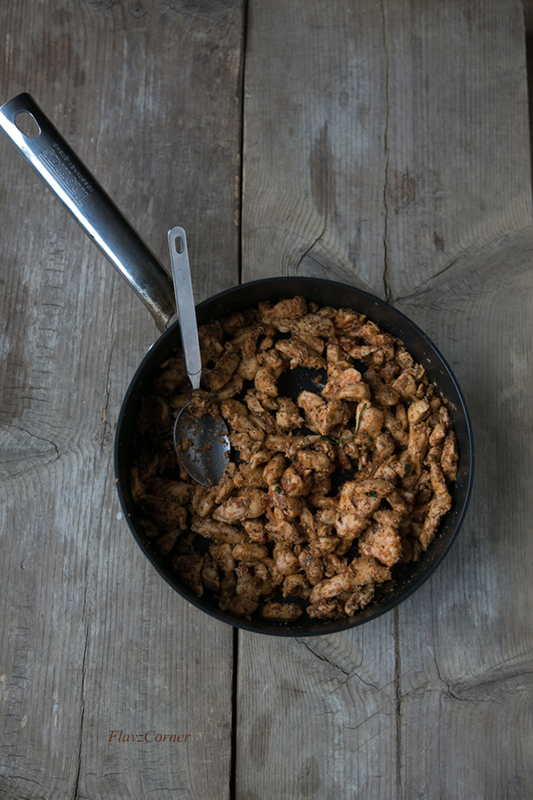 Once it cools down, you can either shred the chicken pieces or leave it as small pieces and keep it aside. Warm the tortilla on a non stick pan for 30 seconds on both sides if using store bought ones. Otherwise if you are using fresh homemade tortillas, you can skip warming it. Divide the chicken filling into 15 equal portions. 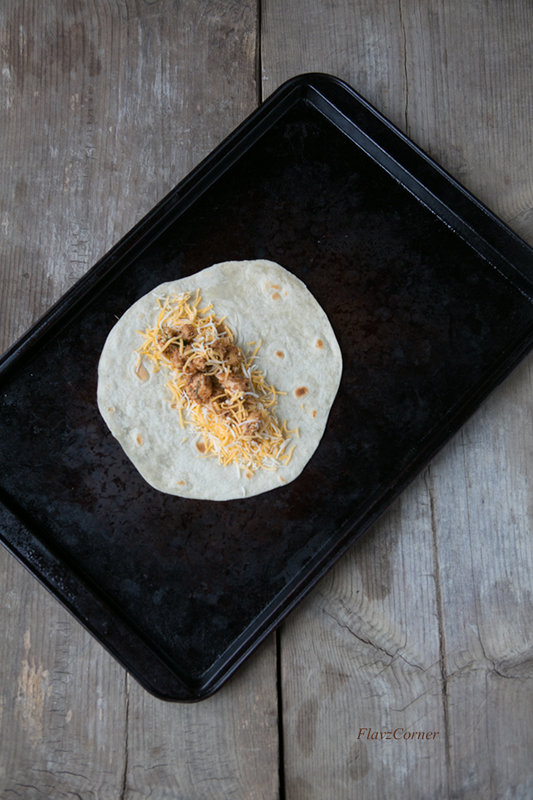 Place a tortilla on the plate or a clean kitchen counter or cutting board. Add 1 tbsp. of shredded cheese on the tortilla. Add the chicken filling and top it with 1 tsp. of cream cheese and 1 tsp of cheddar/Mexican cheese. Roll the tortilla into cigar shape. Place it on a baking sheet with seam-side down. Make rest of the Taquitos this way. Brush the Taquitos lightly with oil. Bake them for 10 minutes on one side and turn the sides and bake for another 5 -10 minutes till the cheese is melted and Taquitos are crispy. Enjoy them hot with your favorite salsa or sour cream. Make sure that you leave some space on the edges of the Tortillas when adding the filling. Otherwise the cheese will ooze out and stick to the pan which will make the Taquitos stick to the baking sheet. I didn't use any cooking spray or aluminum foil on my baking sheet because I made sure that the fillings won't ooze out while baking. Adjust the amount of Chicken, Cheese and spiciness per your taste. This is just a rough measurement with the basic recipe for Taquitos. Be creative and feel free to add any filling of your choice. Left over Taquitos can be refrigerated or stored in ziplock bags in the freezer. They can be reused by baking them in the oven or toaster oven at 350°F for 10 minutes. You can make these ahead, by simple filling the tortillas and roll them into Taquitos and keep it in the freezer in ziplock bags with layers separated by plastic wraps. brush oil on the top and bake in preheated oven with 375°F for 30 -35 minutes till the cheese is melted and Taquitos are crispy. This is not only delicious, also quite healthy, Shibi. Love it! this looks a perfect appetizer for kids,will try sometime..We too love mexican food after coming here..yummy cheesy ones!! Yummy looking rolls. when u made tortillas I knew something else yummy was on the way. I usually go for enchiladas. 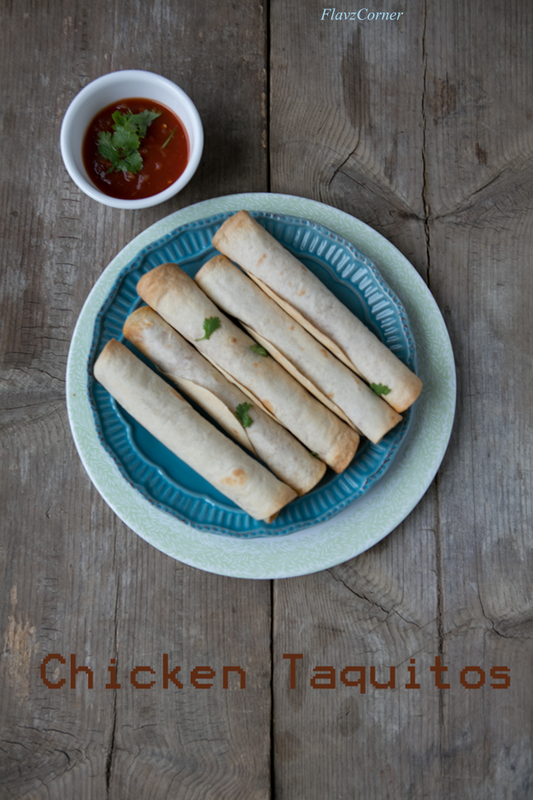 Taquitos are fun both to make and eat! Love them, and yours look superb. Love chicken in them, too -- my favorite! I am also a big fan of Mexican food but somewhat hardly make them at home. 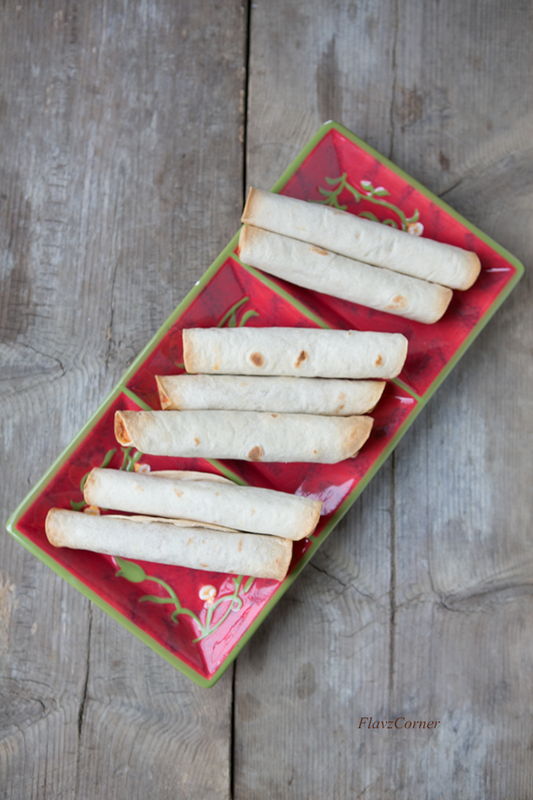 Definitely going to check out your tortilla, these taquitos look so good! Huge fan of mexican food, this looks delicious! !